Living with a sports fanatic means that it’s always game day in my house. This means a lot of gatherings to celebrate the latest and right now it’s all about college basketball series. When we have guests over, I try to keep things as simple as possible when it comes to food. This is not the time to try out complicated recipes because your guests will most likely be focused on the game rather than the spectacular effort that was put into one dish. 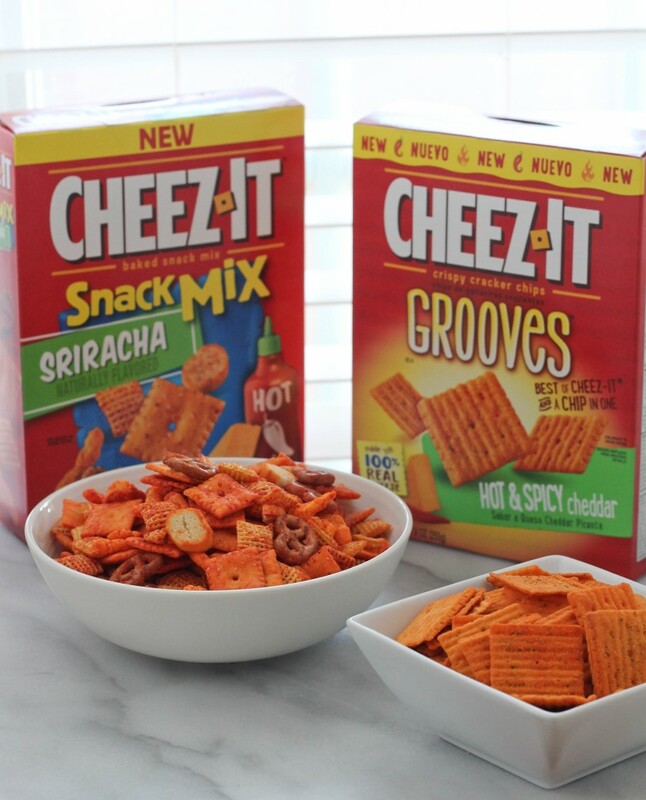 I like to serve up ready-made snacks like Cheez-It Hot and Spicy Grooves or Cheez-It Sriracha Mix that I picked up at Target as well as a few homemade treats like fresh salsas and dips. 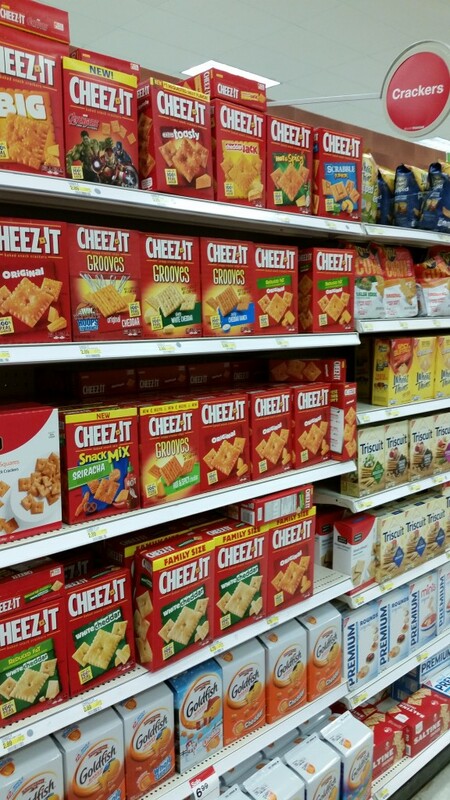 Large boxes of Cheez-It are now available for 3 for $8 at Target now through the first week of April so don’t miss out; these can usually be found either near the check lane or Signal the Seasons Savor Spot section. 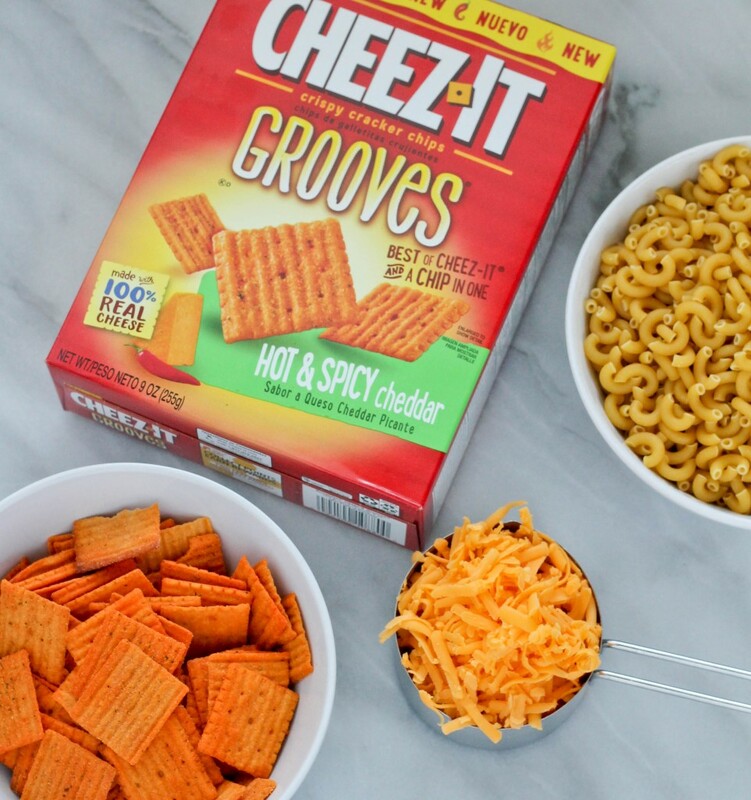 I typically always have Cheez-It in my pantry because I love that it’s made with real cheese and is the perfect snack to serve at game day or anytime! 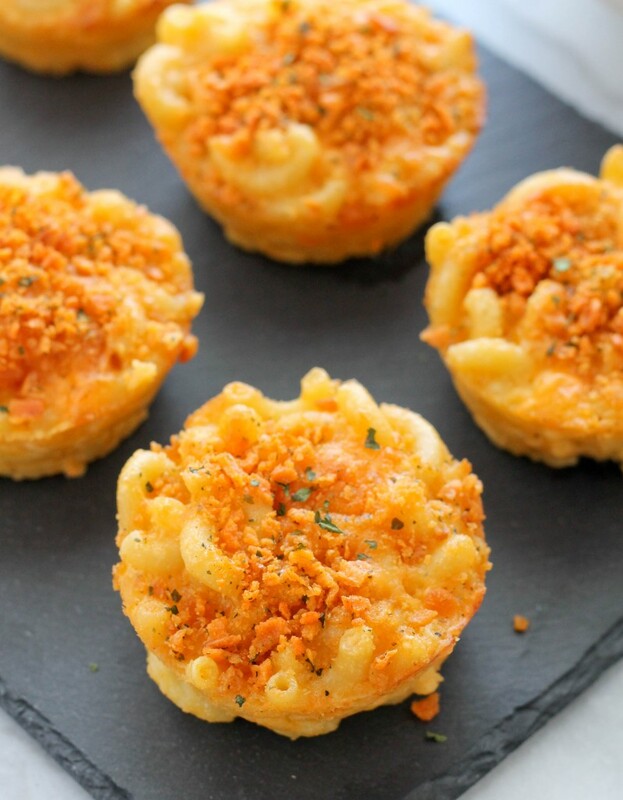 In addition to light bites, I like to serve something a little heavy like chili, burgers or these Cheesy Crusted Mac and Cheese bites. 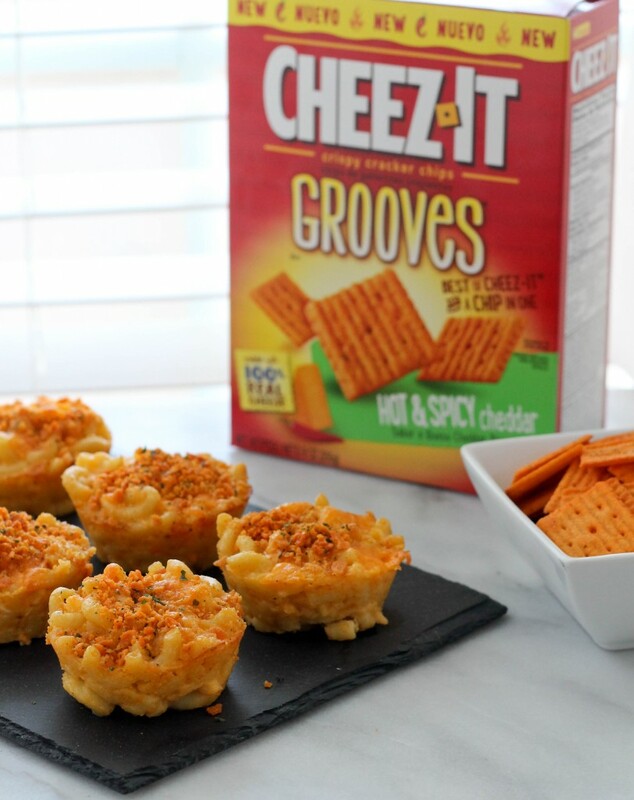 I make my favorite mac and cheese recipe in muffin pans instead of a casserole dish and top it with Cheez-It Hot and Spicy Grooves that I crushed. These are the perfect little bites; crunchy on top and creamy in the middle! Preheat oven to 350 degrees. Grease 2 non stick muffin pans then set aside. Place about 2 cups of Cheez-It in a large ziplock and crush with a rolling pin or place in a food processor and pulse until it resembles coarse crumbs. Mix with dried parsley and set aside. In a large heavy bottom sauce pot over medium heat melt butter. Add flour and stir until smooth. Add milk and cook until milk is warm and sauce has thickened a bit. Add all but 1 cup of cheddar and white cheese, black pepper, Dijon mustard and salt then stir until smooth. Add macaroni to the cheese sauce, stir making sure the macaroni is well coated. Add beaten egg and stir vigorously until it’s mixed in. 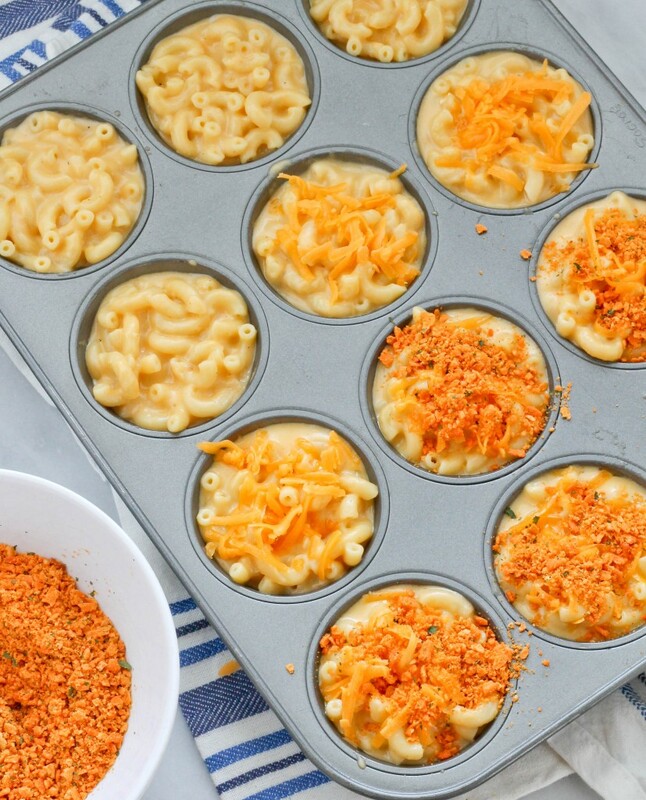 Fill the greased muffin cups to the top with the mac and cheese mixture then sprinkle the tops with a bit of cheese then top with the Cheez-It crumbs. Place into preheated oven and bake for 25 minutes. Remove from the oven and let cool for 20 minutes. To remove the mac and cheese bites from the pan, run a knife along the outside to loosen it from the pan before inverting unto a plate. These are best served warm.